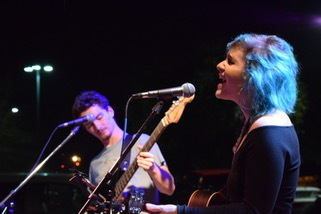 Cat Strickland & John Baldwin lend their voices and musical talent to create some of the most beautiful harmonies and melodies heard around the Charleston area. Three years ago, the two awkward teens met and became fast friends at an open mic in Summerville, SC. Since then, Cat has become a professional musician performing her soulful recreations of covers spanning the decades. John has written and produced several albums from his home recording studio. Their duo show is on display across the low country from Summerville to Charleston. Their set list is as diverse as they are and sure to please all audiences They are excited for the opportunity to play for the 2019 Cooper River Bridge Run for the second year in a row.